Why Did the Chicken Eat the Artifact? Chances are you haven’t spent much time thinking about chicken digestive tracts. This is normal. Here at George Washington’s Ferry Farm, however, the topic actually comes up from time to time. More than once we archaeologists have found ceramic artifacts that have been rounded in an odd fashion, as if tumbled in a river for many years. What accounts for this phenomenon? The answer lies – or roosts, rather – in the coop. Have you ever given thought to how birds eat? How they chew food and digest whole seeds without any teeth? A bird chews its food, but not with its mouth. Most birds use gizzards that essentially act as second stomachs. Almost pure muscle with a strong lining, the gizzard mashes up food to make its nutrients absorbable by the intestines. 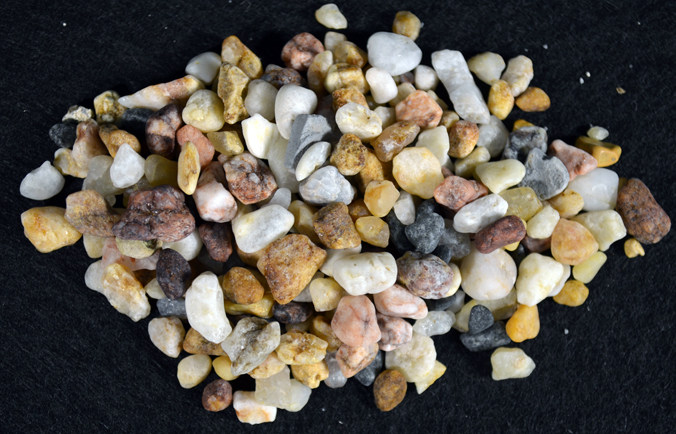 A bird ingests rocks and grit to help the gizzard grind tough foods like seeds and plant material. These rocks are not passed through the bird but remain inside its gizzard until they are completely ground up or the bird dies. Subsequently, these rocks sometimes take on a rounded, polished look because the gizzard is essentially a tiny rock tumbler. Stones recovered from the gizzard of a modern turkey. How does all this relate to archaeology? Simply put, a bird cannot differentiate between a rock and an artifact. The free-range chickens, turkeys, and geese that live with humans gobble up anything that is about the right size for their gizzard, whether rocks, glass, ceramics, or even plastic and metal (The plastic and metal is probably not all that good for them). When a bird is butchered, the gizzard stones – known as ‘gastroliths’ to archaeologists – are released, buried, and excavated to confuse some poor archaeologist hundreds of years later. This is exactly what happened at Ferry Farm. At least one Ferry Farm bird had expensive taste and swallowed porcelain. Some ceramic gastroliths excavated by our archaeologists were in a gizzard so long that the glaze wore off entirely and was ingested. Eighteenth century ceramic glazes contained lead, and this ultimately would have been passed on to the humans who ate the unlucky fowl. Ceramic pieces worn smooth inside a turkey or goose gullet and recovered archaeologically at Ferry Farm. In addition to being an archaeologist, I also keep birds on a small farm. After butchering a few chickens and a turkey, I notice that the size of the gizzard stones reflected the size of the bird. A turkey is capable of ingesting much larger objects as gastroliths than chickens. 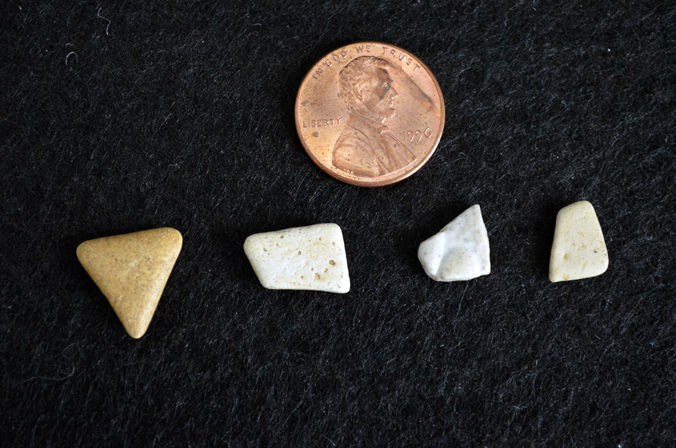 This was such an exciting revelation that I saved some stones recovered from the turkey gizzard and analyzed them. Archaeologists are an odd bunch! The stones were partially rounded and, in addition to rock, the turkey had eaten chucks of concrete and even a bone. 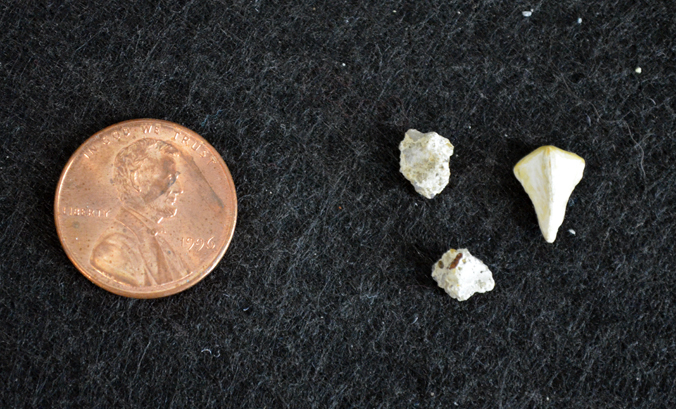 Two pieces of concrete and one piece of bone from inside a modern turkey gizzard. Given the size of the ceramic gizzard stones excavated at Ferry Farm, we can deduce that the birds which ate them were probably large domestics such as turkeys or geese. So we not only learned why the chicken ate the artifact but that it probably wasn’t even a chicken at all. This helps to us to understand what kinds of livestock the Washington family kept at Ferry Farm. Who knew you could learn so much from a beat up piece of pottery in a gizzard?